2017 International Students Career Expo - Sydney, NSW. Every year, the International Students Careers Expo is an initiative of and organised by a number of International Chinese Students Associations and Clubs around NSW. Up to 10 different student associations from University of New South Whales, University of Sydney, University of Technology Sydney, Macquarie University and University of Wollongong have been organising this annual event to bridge the gap of employment between companies and international students and graduates. This event has attracted interest and support of 40 – 50 exhibitors across different industries as well as attendance of thousands of students and graduates around New South Whale. The event has brought a vast array of career advice, employment opportunities, education and further training options. It is to assist international students and graduates achieve their career objectives and professional development. 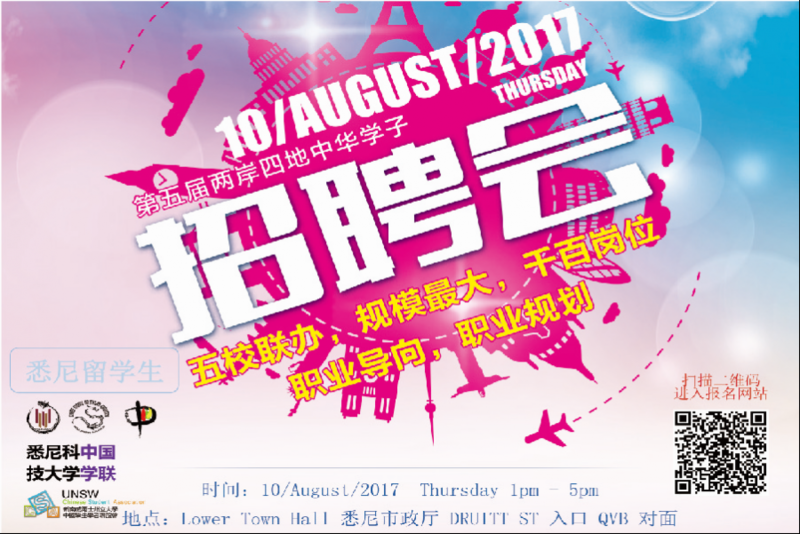 As a comprehensive career event among international Chinese student community in Sydney, NSW, the 2017 International Students Career Expo is on Thursday, 10th of August 2017 from 1pm to 5 pm at the Lower Sydney Town Hall via Druitt Street entrance, opposite to QVB and near the Sydney Town Hall station. Attending the careers fair is an ideal way to meet potential employer face-to-face, accessing up to date career information, exploring your career options and building your professional network and connections. This year event also receives full support from Consulate-General of the People’s Republic of China, Sydney. With more than 40 exhibitors, the event is promised to bring more benefits and potential opportunities on the day. With so much career information under one roof, this one-day event is a must for all international new and current students and graduates seeking a successful future in Australia. NotedCareers is a proud exhibitor at this year event. Our career consultants are looking forward to having career conversations with all visitors around career options, career paths and career objectives for international students and graduates.